I made banana crumpets as my choice for The Secret Recipe Club. At the end of January, two things happened which were serendipitous. The first was that when I went to get my daily banana out of the fruit bowl, I noticed that all of them were over ripe. Our summer days are very hot, with temperatures well over 30 ºC (86º F). This means that fruit does not last very long when left open to the elements. The second thing that happened was that my Secret Recipe Club assignment landed in my inbox. This month I was given Our Eating Habits as the blog I had to find a recipe from. Jamie says “why waste time on bad food” – and I agree! While I was doing computer work I randomly selected categories and read the post titles. There was no doubt in my mind that the banana pecan pancakes were meant to be made by me! I have called these crumpets as in South Africa, pancakes are thin – more like crêpes. Crumpets are thicker and more like drop scones or pikelets. I have adapted the recipe to suit our tastes and what was in my fridge that needed using up! I am not particularly fond of cooked pecans so I left them out all together. I also had some yoghurt which was about to turn so instead of shopping for buttermilk, I made these with yoghurt. I also halved the original recipe and this made enough for breakfast for two days! Dave does not like cooked whole bananas so I was quite impressed when he liked these. We served them with some jam but you could serve them with fresh fruit like in the photograph. Thanks Mel, I loved them! Lovely! Great way to start your day! very healthy in my opinion! Lovely and looks delicious! Great way to start your day. I love bananas! Such a great recipe. 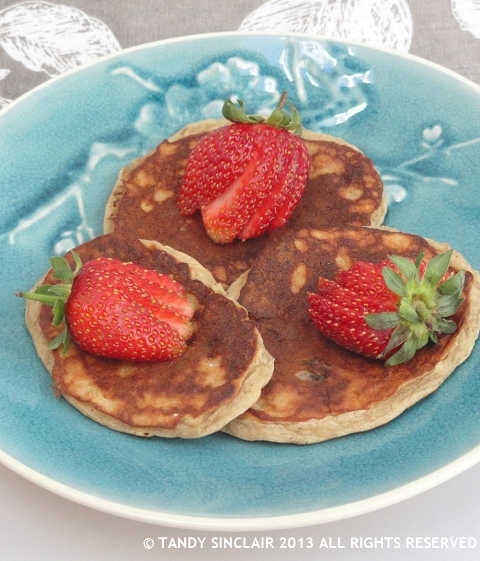 Ahh, crumpets, pancakes, crepes – whatever they are called, I’m in love. Look forward to trying out your version soon. Glad to learn about your blog via SRC – where in South Africa do you live? The best trip of my life was a week visit to your country – just gorgeous. Looks delicious! Great SRC choice! Yum! We make banana pecan pancakes quite often at our house. Yours look great! I do eat bananas but haven’t baked with them in ages. Two of my kids aren’t very fond of them. I absolutely eat bananas! These crumpets look tasty! I love bananas, and pancakes with bananas sound 10 times better! I can’t wait to try them. Lovely looking crumpets! I love bananas!! then you will love these! Love the fresh fruit on these! I so want them for breakfast! My son loves making things like this, I know he will go crazy for it! Banana-infused treats are the best! These sound awesome. I love banana pancakes. Lately though my family has been finishing the bananas off before they get ripe enough for me to make anything with them. I guess I need to buy extra next time! 🙂 Your pancakes turned out looking delicious. Yum! They look delicious Tandy. I absolutely love crumpets and love the idea of adding banana to the batter. I love this recipe, as I could easily make this dairy-free and use soy yogurt for my milk allergy kiddo. Looks delightful and I think I could toss in a few chocolate chips and my kids would eat it up! I always am looking for ways to use up over-ripe bananas! I can’t wait to try these! it is such a great way to use them up! These look postively delicious! Great SRC choice! I love the use of banana and yogurt together! So yummy! They look yummy! So glad you liked them. Interesting, that you call them crumpets, I love it! I had a habit for years of having a banana for breakfast.